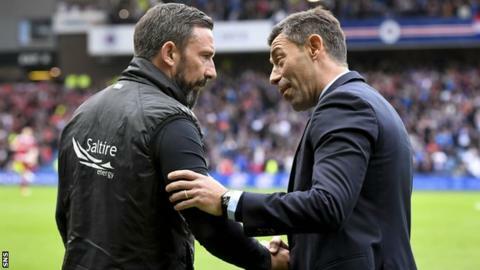 Rangers manager Pedro Caixinha told counterpart Derek McInnes not to come into his office following Aberdeen's 2-1 win at Ibrox. Caixinha said he was not received after an invite for a post-match drink when the teams met at Pittodrie last month. "It is a question of respect," he said. "If I am not being respected then, please, don't show up." However, McInnes insists the Portuguese was "mistaken", adding "every manager is welcome in my office". Aberdeen earned their first victory at Ibrox since 1991, with Graeme Shinnie and Ryan Christie scoring before Martyn Waghorn's reply for the hosts. Following an exchange between the managers at full-time, Caixinha explained: "I was just saluting him and saying I didn't understand the reason why he invited me to be received in his office and didn't show up at the previous match. "So I said that if you didn't show up in the previous match, you are definitely not welcome to come to my office. "If he didn't show up and I waited more than 15 minutes, what do you call that? "I am a guy who came here to do my job. I know I am maybe the only foreigner but I have already passed through this situation in Mexico so I am used to it." McInnes said of events at Pittodrie after Rangers' 3-0 win on 9 April: "I was doing my media duties as I normally do and there is absolutely no way I would be like that with any manager and I never will. "It's not something you can aim at me. He's wrong, he's mistaken. If he thinks that then maybe he should have said to me before - I don't know. "[Assistant] Tony Docherty and my staff were there at the time and told me they came in, had a quick glass of red wine and shot away. They made their apologies for having to leave so soon. "I was still doing my media work and it was no longer than any other time. I would never disrespect any manager in terms of after the game." McInnes had previously criticised Caixinha for revealing his admiration for Dons skipper Ryan Jack and this week said Rangers "should probably be embarrassed that they've not finished second" owing to the Glasgow side's greater financial clout. Aberdeen are Premiership runners-up for the third season running with Rangers, nine points behind with one round of games remaining, consigned to third place. "I'm really pleased because a lot of supporters have come here since 1991 with high hopes and left with disappointment," added McInnes. "I'm delighted we have managed to tick that box. My team has broken a lot of records and it's a positive period." On the few angry words between the pair during the action, McInnes said: "Managers and benches can get passionate on the touchline. There was a couple of calls, one or two things, and I argued with him as he did with me." Caixinha, who has won five of his 10 matches in charge, said: "I'm not focused on Aberdeen next season. The focus at this club is always to be number one. "We don't misunderstand things here. I know what it represents to be in this chair, despite many others who should like to be here but they aren't. "I know what the job represents and I am here to defend the club and work for the club."